Read and write to RFID tags up to 6cm away. Supports EM4100 series, ISO11785 FDX-B and our own PhidgetTag protocols. Replaced by the 1024_0B - PhidgetRFID Read/Write. It is the exact same device, but it comes pre-assembled in a plastic shell enclosure and you can now choose which cables you want to have included. 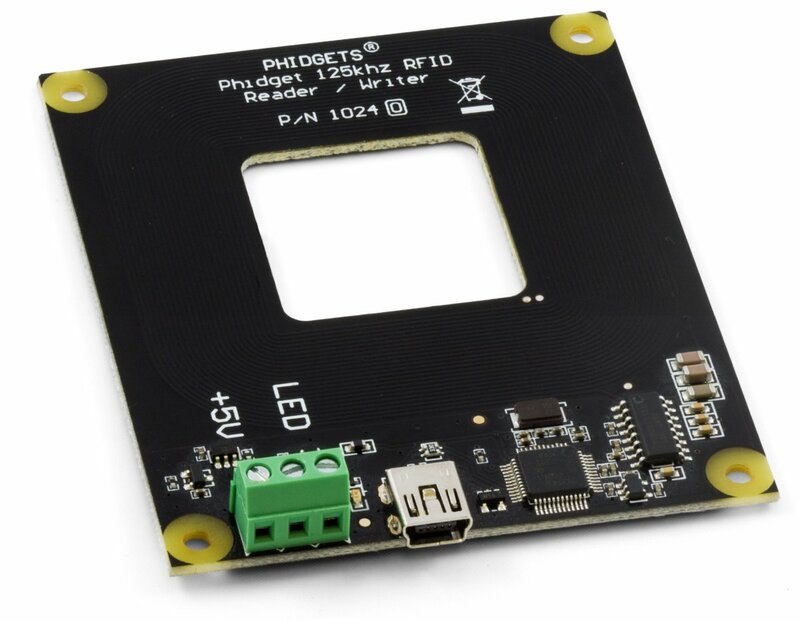 The PhidgetRFID Read-Write reads RFID tags that are brought in close proximity to the reader and returns the tag identification number. Writing data to T5577 tags is also supported. For a list of compatible RFID tags that we have available, see the Connection & Compatibility tab. RFID (Radio Frequency IDentification) systems use data strings stored inside RFID tags to uniquely identify people or objects when their tags are scanned by an RFID reader. These types of systems are found in many applications such as passport protection, animal identification, inventory control systems, and secure access control systems. 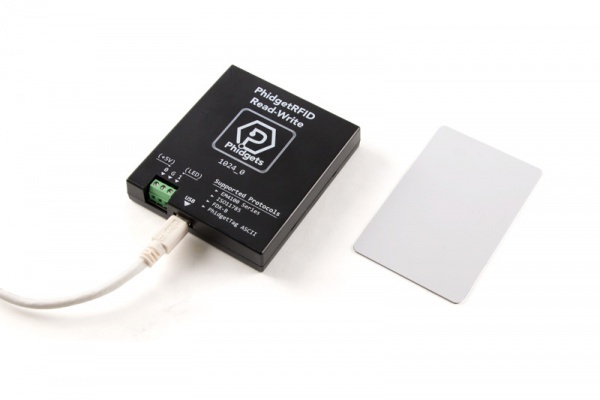 The PhidgetRFID Read-Write supports reading and writing in 3 protocols; EM4100, ISO11785 FDX-B, and PhidgetTag. The PhidgetTag protocol simply stores up to 24 ASCII characters to the tag, eliminating the necessity for a table of corresponding tag numbers and names in your program. 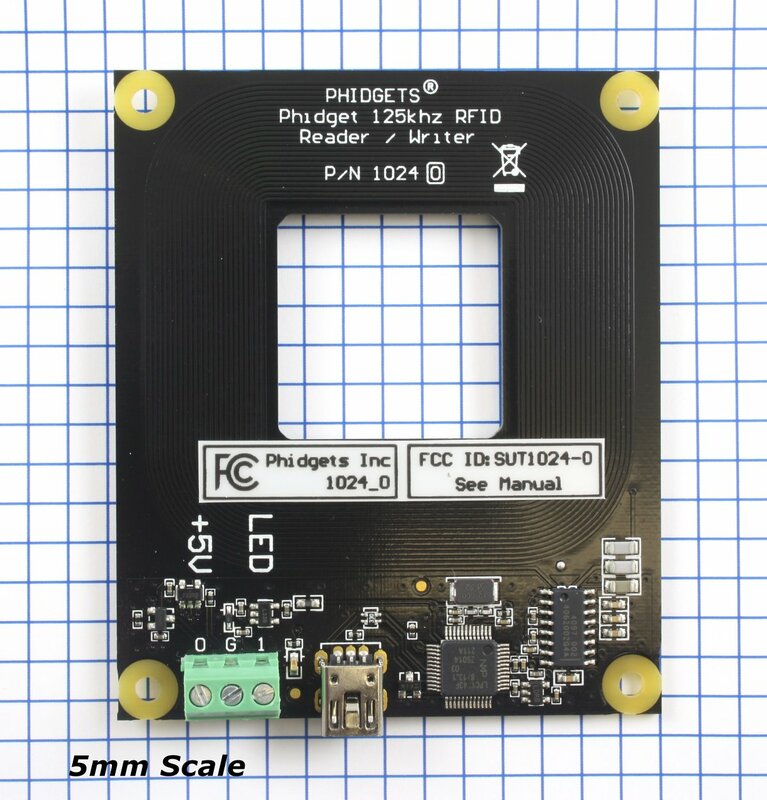 Phidgets sells EM4100 read-only tags that can be read with either of our RFID readers, and writable tags which can be written with the 1024 using any protocol. Any 3rd-party EM4100 or ISO11785 tags can be read. Because passive tags require a strong RF field to operate, their effective range is limited to an area in close proximity to the RFID reader. The distance over which the RFID tag is usable is affected by such things as the tag shape and size, materials being used in the area near the reader, and the orientation of the reader and tag in respect to each other and in their operating environment. The smaller a tag, the closer it must be to the reader to operate. The 1024 has two digital outputs, labeled "+5V" and "LED". These work the same as any other Phidgets Inc. digital output, except that the "+5V" output has a higher current rating. You can use these outputs to have an LED or buzzer to indicate when a tag read has occured. The 1024 - PhidgetRFID Read/Write replaced our previous RFID Reader, the 1023 - PhidgetRFID. Now that you have everything together, let's start using the 1024! In order to demonstrate the functionality of the 1024, the Phidget Control Panel running on a Windows machine will be used. Linux users can follow the getting started with Linux guide and continue reading here for more information about the 1024. Bring a compatible tag close to the 1024 and the tag's string and protocol will be displayed. Blank tags will not display anything until they are written to. Toggle power to the antenna using the checkbox labelled Antenna Enabled. Toggling antenna power decreases power consumption, however, the 1024 will no longer be able to read or write tags. Enabling the Keyboard Output Enabled checkbox will cause your computer to write a string of text whenever a tag is discovered. Park your cursor in an empty text file and try it out! Write to a tag by selecting the protocol from the drop-down menu, entering the desired tag in the Tag String text box, and pressing the Write button. If you enable the Lock checkbox, the tag will be permanently written to, and it will be impossible to overwrite. Double-click on one of the Digital Output objects available in order to run the example. They are labelled Digital Output, LED Driver, and Onboard LED. 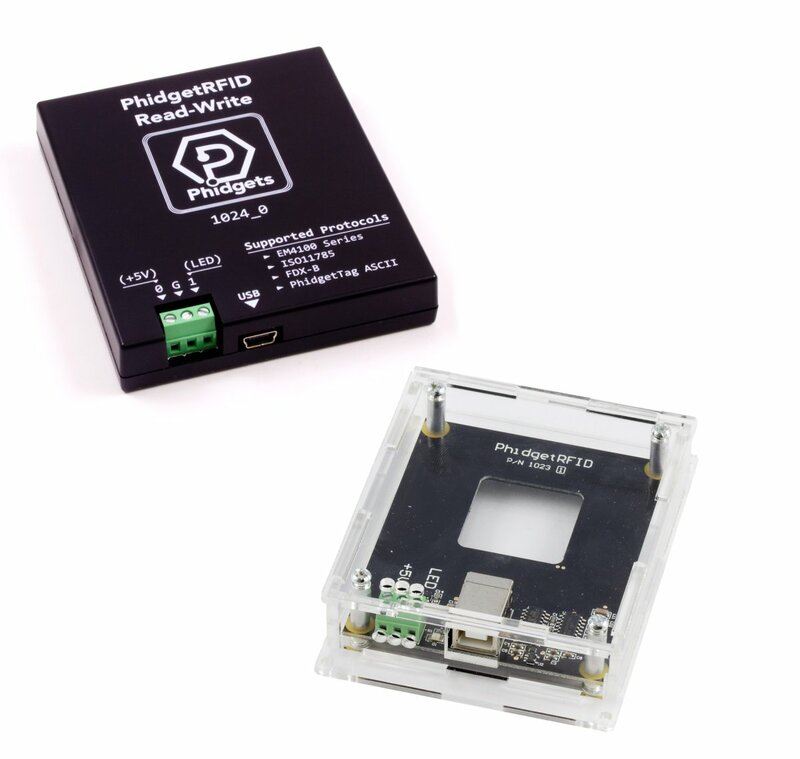 This Phidget is compatible with the RFID Examples and the DigitalOutput Examples. We support read-only tags that have been programmed with a supported protocol, as well as T5577 type tags for writing. T5577 tags can be written with any of the supported protocols. Fresh T5577 tags that have never been programmed may show up as an EM4100 tag, or may not show up at all. After writing, they will always show up as the written tag. We also support a lock function which prevents a tag from ever being re-written. A protocol is a way of encoding data on an RFID tag. This is not the same as the tag type. For example, we support the T5577 tag type, which can be programmed with any of the protocols which we support. We also support read-only tags which have been programmed in any of these protocols. EM4100 (also known as EM4102) is the protocol that all previous PhidgetRFID readers have supported. Therefore, if you want to use the 1024 to write to writable tags to be read with previous versions of the PhidgetRFID, you need to write them in this protocol first. This protocol encodes 40 bits of arbitrary data. Read-only tags that are factory programmed with this protocol are supposed to be unique. Phidgets represents this protocol as a 10-digit hex string, include leading 0's (e.g. 0087f3bc91). This is the format to use for writing new tags, and to expect from the tag events. ISO11785 defines tags used for animal IDs. If you have a pet cat or dog, chances are high that they have one of these tags implanted. FDX-B refers to the way that the ISO11785 data is encoded on the RFID tag, and is the industry-standard encoding scheme. This tag consists of a 10-bit country code and a 38-bit unique ID. The country code is ISO 3166. The '999' code is set aside for testing. The unique ID is 38-bit unsigned, so that's a range of 0 - 274,877,906,943. Phidgets represents this protocol as a 15-digit decimal number string - concatenated 3-digit country code and 12-digit id. For example, 999000000000123 would represent the testing country code and an id of 123. Please note that the 12-digit id part cannot exceed the 38-bit maximum integer value of 274,877,906,943. Note that Animal tags with a valid country code are supposed to be unique. Of course, with the 1024 you can freely copy an existing Animal Tag. The PhidgetsTAG protocol is an internal protocol only supported by the PhidgetRFID 1024. The ASCII data must be 7-bit, so no extended ASCII support, but standard text is all supported (as well as control codes). Make sure to attach a diode across the terminals of the relay if you are using output 0 on the RFID board to drive it. 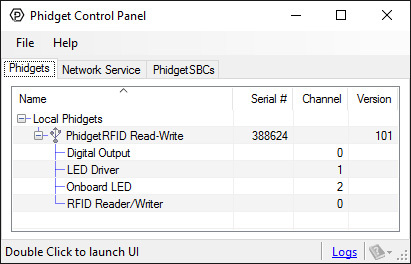 The PhidgetRFID has four outputs - two of which are available to the user, and two of which are for internal control of the Phidget board only. Output 0 is a +5V source from the USB bus through a P-Channel MOSFET with less than one ohm impedance. This can be used to switch a TTL or CMOS device, or it can be used to drive a 5VDC relay such as the Aromat JS1-5V. 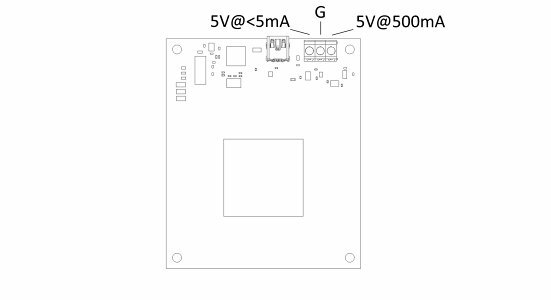 Output 1 is an LED drive output at 5VDC with maximum 15mA of available current (250 ohm CMOS output). Both Output 0 and 1 are available in hardware at the terminal blocks on the PhidgetRFID board. If Output 0 is used to drive a relay, a fast clamping diode must be placed across the relay drive pins as shown in the diagram on the right. Not doing so can result in permanent damage to the PhidgetRFID board. If you are using multiple RFID readers, placing them too close together will cause interference when reading tags. You could work around this problem by rapidly "polling" each 1024 by turning the antenna on, checking for tags, and then turning it off in sequence. Of course, this will lengthen the amount of time it takes for your system to read a tag, since you may have to wait for the nearest reader to become active. When trying to read tags, you should allow the tag to remain within detection range for at least 50ms. Tags moving through the detection area faster than this may not register at all. 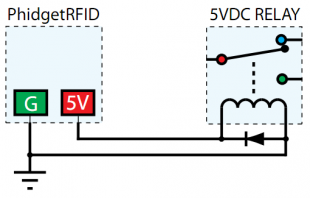 For more information on RFID readers and tags, visit the RFID Primer. Note: The manufacturer is not responsible for any radio or TV interference caused by unauthorized modifications to this equipment. Such modifications could void the user’s authority to operate the equipment. The user is cautioned that any changes or modifications not expressly approved by the party responsible for compliance could void the user’s authority to operate the equipment. •	Reorient or relocate the receiving antenna. •	Increase the separation between the equipment and receiver. •	Connect the equipment into an outlet on a circuit different from that to which the receiver is connected. •	Consult the dealer or an experienced radio/TV technician for help. This unit was tested with shielded cables on the peripheral devices. Shielded cables must be used with the unit to ensure compliance.